North Korean news agency reports Trump and Kim extended invitation to one another to visit the other's country, and both accepted. 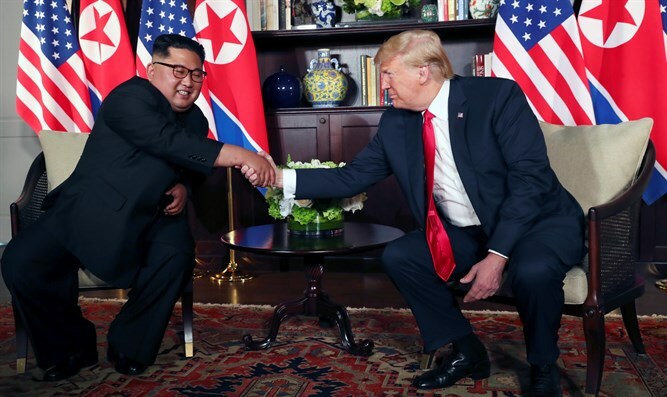 U.S. President Donald Trump and North Korean leader Kim Jong Un invited each other to visit the United States and North Korea respectively, and both accepted the invitation, North Korea’s official news agency KCNA reported Tuesday night. “Kim Jong Un invited Trump to visit Pyongyang at a convenient time and Trump invited Kim Jong Un to visit the U.S. The two top leaders gladly accepted each other’s invitation,” Reuters quoted KCNA as having said in a report about the two leaders’ meeting in Singapore. An earlier report in KCNA indicated the North Korean leader had said it was "urgent" for North Korea and the United States to halt "irritating and hostile military actions against each other" during his talks with Trump.